Two petitions have been filed in the Supreme Court to review the September 26 Judgement which upheld Aadhaar’s Constitutional validity. Three months after the Supreme Court delivered its Judgement on the Constitutional validity of Aadhaar and the Aadhaar Act, two review petitions have been filed regarding the September 26 decision. On December 25, Rajya Sabha member and Congress leader, Jairam Ramesh has filed a review petition against the Judgement’s decision to uphold the passage of the Aadhaar Act as a Money Bill. The same day, Imtiyaz Ali Palsaniya, one of the impleaded petitioners in the original petition, also filed his petition on the ground that his arguments against the Act had not been considered in the September Judgement. One of the major challenges to the Aadhaar Act was its passage as a Money Bill. Money Bills are described under Article 110 of the Constitution. The main feature of a Money Bill is that it should relate solely to payments from and to the Consolidated Fund of India. Another feature of a Money Bill is that the Rajya Sabha has no say in the matter and can only offer recommendations which the Lok Sabha is not obliged to implement. The crux of the arguments against the Aadhaar Act from this perspective was that the section 57 of the Act enabled private entities to demand Aadhaar. However, the fact that private entities do not offer services paid for by the Consolidated Fund of India would disqualify the Aadhaar Act. The majority decision severed the portions of section 57 related to the private sector and consequently upheld the validity of the Act being passed as a Money Bill. Another aspect of a Money Bill is that the Lok Sabha speaker’s decision is final on any question arising as to whether a Bill qualifies as a Money Bill or not. Justice Chandrachud in his dissenting Judgement held that the finality of the speaker’s decision relates only with respect to the Rajya Sabha and the President. The speaker’s decision is not immune from judicial review. According to reports in The Hindu and The Indian Express, Jairam Ramesh has relied heavily on Justice Chandrachud’s dissenting Judgement. Palsaniya’s petition as accessed on Live Law raised several issues with the Judgement. Firstly, that the section 2(k) of the Act states, ““demographic information” includes information relating to the name, date of birth, address and other relevant information of an individual, as may be specified by regulations for the purpose of issuing an Aadhaar number, but shall not include race, religion, caste, tribe, ethnicity, language, records of entitlement, income or medical history;”. From this perspective, the petitioner contended that the linking of Permanent Account Numbers (PAN) with Aadhaar under section 139AA of the Income Tax Act becomes untenable. This was one of the few mandatory linkages that the Supreme Court had upheld in its September Judgement. Another issue raised in linking PAN with Aadhaar is that the Judgement had laid down that the scope of the Act be limited to only matters related to benefits, subsidies and services. The petitioner has stated that filing income tax returns is a statutory mandate and does not fall within any of the three categories. The petitioner alleged that during the intervening period between 2010 and 2016 before the Act had come into force, enrolment was carried out by private entities and Biometric Service Providers (BSP). The BSPs provided the technology to carry out enrolment and were not Indian. Hence, foreign entities had access to the demographic information of Indian citizens. The petitioner has alleged that the Unique Identification Authority of India (UIDAI), the apex authority regarding Aadhaar has not mandated the information that was stored prior to the CIDR (Central Information Data Repository) to be deleted or destroyed. 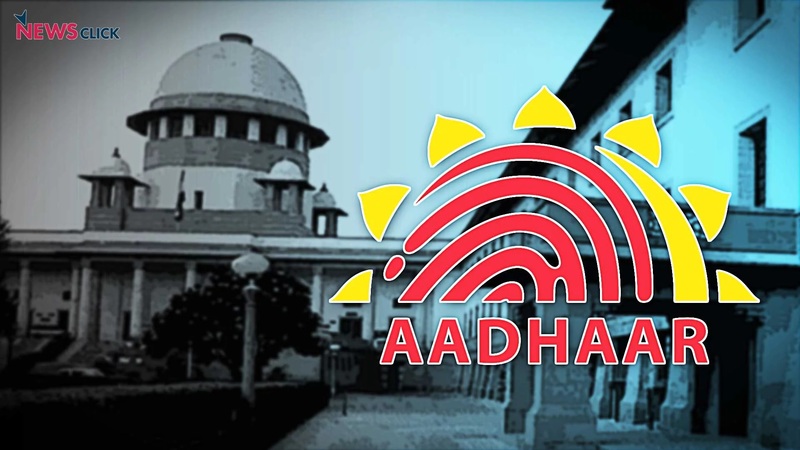 The petitioner also pointed out that after reading down section 57 of the Aadhaar Act, the Supreme Court did not pass any directions regarding the Aadhaar data already held by private entities. By reading down section 57 the Court had excluded private entities from being able to demand the production of Aadhaar. However, for the years leading up to the Judgement, private entities had coerced consumers into linking their Aadhaar with bank accounts and SIM cards among other services. That no order to delete this data was passed is another defect the petitioner pointed out. The final issue raised by the petitioner is that Aadhaar has blurred the lines between a citizen and a resident. Aadhaar is available to all residents. However, not all residents in India are citizens. Hence, it is not improbable that there may be several non-citizens who have obtained Aadhaar. However, Aadhaar has been made mandatory for availing benefits, subsidies and services, all of which are the exclusive rights of citizens. Another problem with the Aadhaar architecture is that Aadhaar can serve as a starting document to avail voter identity and ration cards, two documents that are also exclusively for citizens. It is not improbable that an undocumented migrant can obtain an Aadhaar through the introducer system and subsequently obtain a series of citizenship documents.